Three-horned bedstraw, bedstraw, rough bedstraw, rough fruit corn bedstraw, corn cleavers (Galium tricornutum) is a declared pest in Western Australia (WA). This article describes the nature of the plant with links to requirements land owners/occupiers must adhere to, pest control methods and how to search, detect and report it. Native range is from Europe to central Asia. 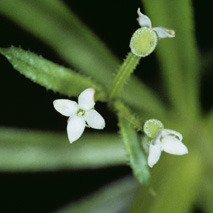 A widespread but relatively uncommon weed of cultivated land and other disturbed areas in temperate parts of the world, including south east Australia. In Australia it is mainly found in paddocks that have been cropped for a number of years. Appears worse in areas that have pulse crops incorporated in to the rotation. Principally occurring on alkaline soils with annual rainfall from 300-550 millimetres, but also found on other soil types. Known host to the stem nematode, Ditylenchus dipsaci. Its seeds contaminate fodder and grain. At high densities can cause considerable yield loss in crops. Known in WA from a few separate sites on farms in the central and southern wheatbelt. Stems: sprawling stems usually 50 centimetres long, can be up to one metre long. Square when cut across. Stems covered with downwardly pointing prickles, especially along the ribs. Leaves: long narrow flat leaves arranged in whorls, first leaves arranged in groups of four, with a pointed tip and a few hairs along the margins, mature leaves in whorls of six or seven, broader, with backwardly pointed prickles on the margin. Flowers: small and white, carried on short branched stems arising from the leaf whorl. Fruit: each flower forms a pair of 'seeds' that separate when mature. They are globular, two to three millimetres in diameter, light to dark brown when dry, have a rough surface and borne on a hooked stem. 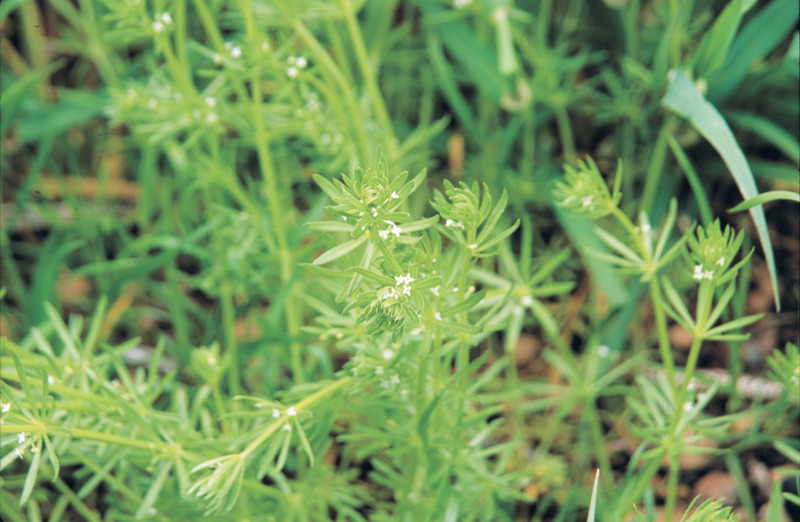 Bedstraw is a competitive climbing plant that can form dense tangled clumps in crops. 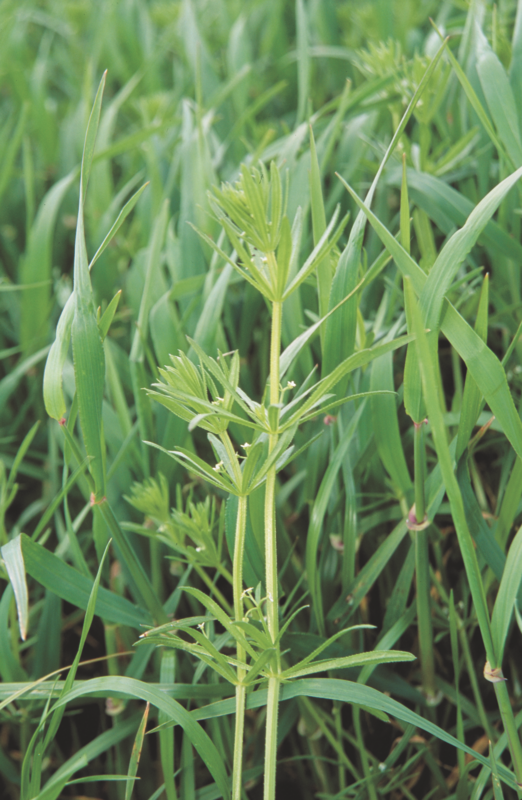 There are effective herbicides for cereal crops and grass pastures, but it is more difficult to control bedstraw in canola, pulses and legume-based pastures. 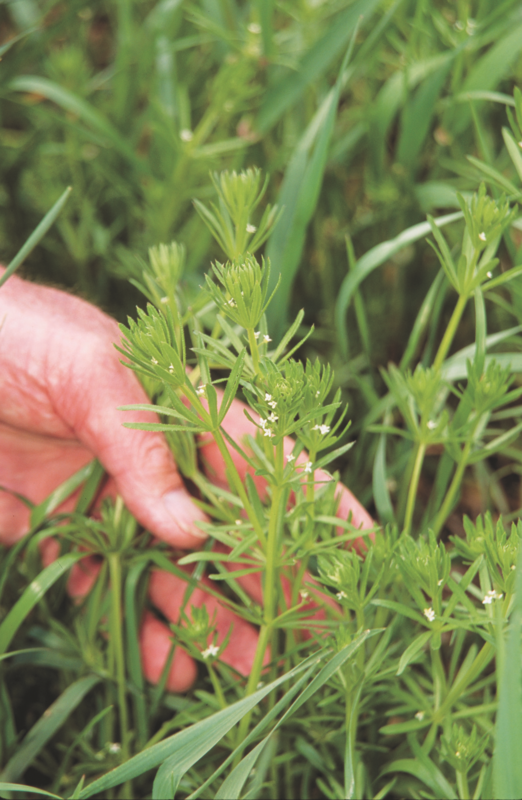 Modelling indicates that three horned bedstraw would cost Western Australia $1.5 million each year if it is not managed and $1.4 million if it is managed. The Western Australian Organism List (WAOL) contains information on the area(s) in which this pest is declared and the control and keeping categories to which it has been assigned in Western Australia (WA). Use the following WAOL link to reach the declaration and declaration map for: three-horned bedstraw. Detectability: medium difficulty to find. 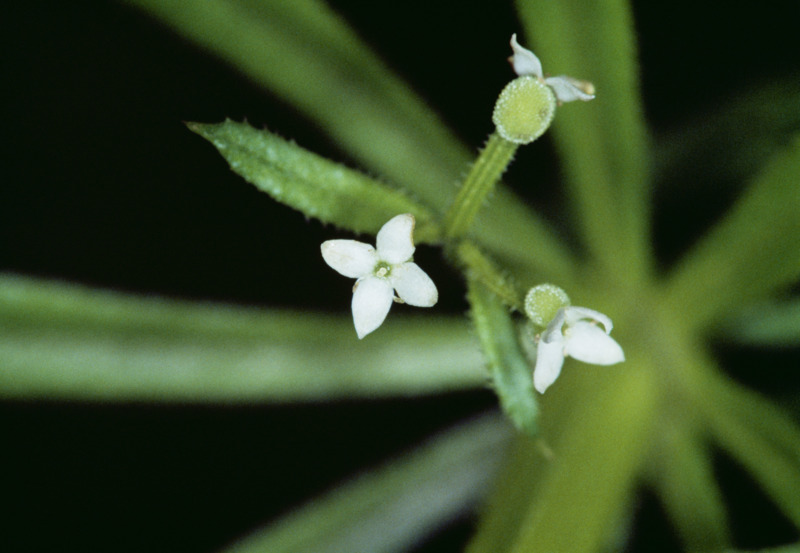 Bedstraw is hard to distinguish from other Galium species. However, it is easy to recognise amongst crop and pasture plants because of its distinctive appearance and feel. Who is likely to find it: only cereal, pulse and oilseed grain growers or agronomists in the South West Land Division. When to find it: plants are most likely to be found from late winter into spring, in any part of the South West Land Division where broadacre crops are grown. Where to find it: new infestations are likely to be identified in young crops between rows before the crop canopy closes. It may also be found in pastures and fallow paddocks. Bedstraw is most likely to be detected in grain through a screening program implemented by CBH Group funded by Grains, Seeds, and Hay Industry Management Committee. Once bedstraw is confirmed, surveillance must be carried out. Report the presence of this organism before undertaking a control measure. 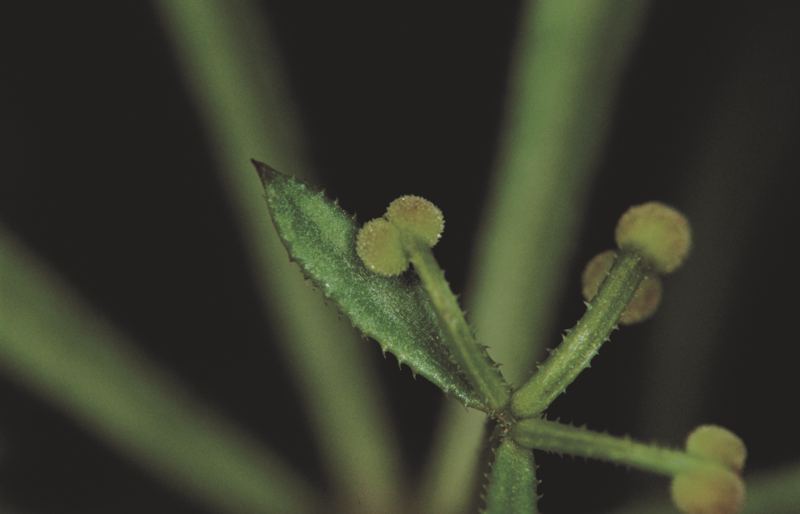 Control methods for this declared plant can be found through the three horned bedstraw control link. Further information on three horned bedstraw can be found through the three-horned bedstraw: what you should know page.